First of all - YOU GUYS. I posted a recipe yesterday for Crispy Peanut Butter Cup Bars. I told you that it was chosen to make because it was uber caloric. And yet you all want to make them! I've gotten probably the biggest positive response having posted that recipe. I told you how naughty they are, and you are chomping at the bit to make them at home. Tisk, tisk. Well, guess what? You're probably gonna want to make these cupcakes - they're naughty, too. Don't worry - I'm not putting out a double standard here. No, nothing crazy like that. I mean, I make these things just so I can share them with you! But tomorrow - they are all leaving my house. 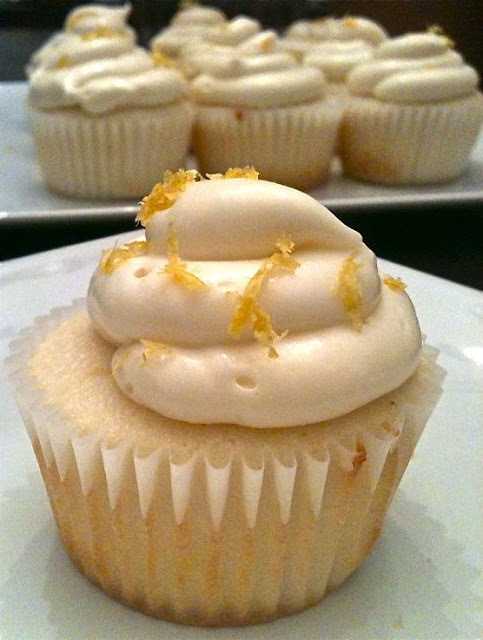 So, if you work with me or The Stallion, be on the lookout for some Lemon Creme Cupcakes. First come, first serve! So, on to the cupcakes at hand. I've decided to take myself out of my comfort zone. I'm going to push myself to learn how to make new things. Especially things I've never attempted before - or maybe even eaten before. And you get to come along for the ride! They are awesome! And really not very difficult at all. They're a great spring/summertime dessert. Light and fresh. But also like a little ray of sunshine. And everyone needs a little sunshine in their life. Center a rack in the oven and preheat to 350 degrees. 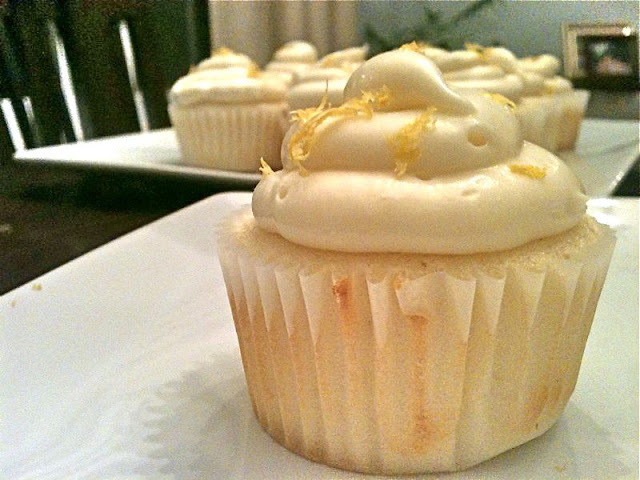 Prepare cupcake tins by using liners or spray with non-stick cooking spray. Place flour, baking powder and salt into sifter and rest on a plate. Put the sugar and lemon zest in a mixer bowl or another large bowl and rub them together with your fingers until the sugar is moist and fragrant. Or until it looks like yellow snow. Whatever makes sense to you. Add the butter and, working with the paddle or whisk attachment, or with a hand mixer, beat at medium speed for a full 3 minutes, until the butter and sugar are very light. Beat in the extracts, then add one third of the flour mixture, still beating on medium speed. Beat in half of the milk-egg mixture, then beat in half of the remaining dry ingredients until incorporated. Add the rest of the milk and eggs, beating until the batter is homogeneous, then add the last of the dry ingredients. I didn't want to use that much sugar, but the sugar is integral in getting the right consistency in the frosting - less sugar equates to 'soupier' icing.